Nicholas Herrmann is a writer and photographer based in Bath. His work has appeared in journals and online, and his writing has been shortlisted for the Bath Novel Award and Janklow and Nesbit Prize. 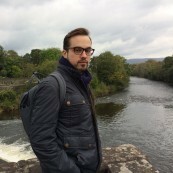 He is a graduate of the Creative Writing MA at Bath Spa University. He is currently working on his first novel. You can find him on Twitter here.